There's no way that this bird fancier can ever look at a bird to any further extent and not think dinosaur. For our national symbol a bald eagle I believe dinosaur. For blessing turkey banquet we're dining on dinosaur. Every nighttime when I put my head on my pillow, I am sleeping on dinosaur nap. I have Gina Gould, Curator of Science at the Bruce Museum, to thank for my new view. She's the one who brought the current exhibition "Chinasaurs: Dinosaur Discoveries from China," featuring Chinese dinosaur discoveries -- including a tantalizing dinosaur nest and eggs -- to the Bruce. As part of the exposition, Gould brought in more than a few of her imposing friends to tell us all about how dinosaurs are still with us in the form of birds. In February there was Dinosaur Paleontologist Lowell Dingus, who through the Great Halls of the American Museum of Natural History. He's the one who converted Gould, fresh out of the Peace Corps, to suit a paleontologist, which she did. In his lecture on "The Rise and Alleged Demise of the Dinosaurs," Dingus told a full house about how the hypothesis of an evolutionary link among dinosaurs and birds came about. The year was 1870 when British scientist/embryologist T.H. Huxley became the first man to say that birds are dinosaurs. Huxley, who alleged in his friend Darwin's new premise of development, noted the similarities of the creatures. When he looked at the hindquarter of a chicken, he saw a dinosaur. "With meat-eating dinosaurs the legs come directly down from the hips, as they do in birds." 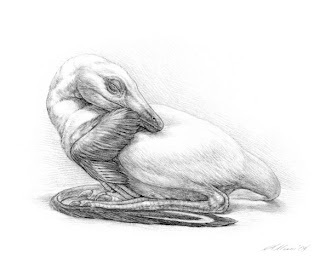 Dingus said, relating Huxley's comments, "The dinosaur foot has three toes with one inside big toe sticking rearward, as do birds." Dinosaurs have hollow bones," he said, thus making it easier to carry around their weight. "Birds have hollow bones, building it easier to fly." And dinosaurs give us wishbones, as do birds, as of their fused collarbones. Dingus, as Associate Research Curator, Vertebrate Paleontology divisions he's also Project Director of the Yale Peabody Museum Great Hall -- has authored many a systematic detection book. But he ended his talk with the final praise to Huxley. To another guest speaker and Gould friend, Dr. Mark Norell, that theory was no joke. 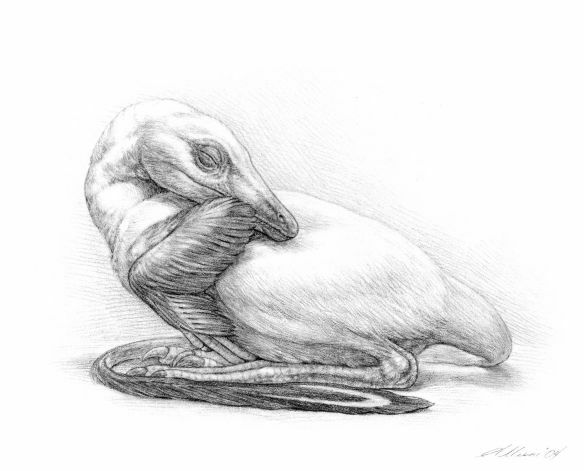 Norell, who spoke in March on "Dinosaurs among us," discussed how truly outstanding those feathered dinosaurs were. No need for fantasies like Jurassic Park, said Norell, who is the AMNH's head of Paleontology and Curator of Dinosaurs. "Talk about Godzilla," he said, looking back at dinosaur time. "There were millions of birds with strange nap, brilliantly colored, incredibly more colored than the movies have shown us." 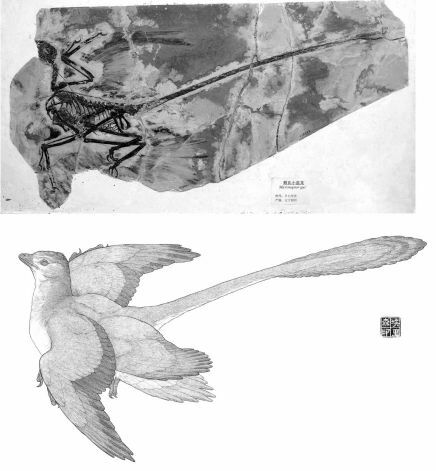 Norell offered slides to illustrate his startling comments -- artist conceptions of avian dinosaurs found in fossils in China that had red combs on their heads, like roosters, with strange angled feathers. In Norell's mind, all dinosaurs sported feathers! Norell, who Gould introduced as "one of the coolest guys alive," has researched the dinosaur/bird link in the field. In one slide of him at work on the Gobi Desert he looks a paleontologist cowboy. Norell's numerous discoveries include the first indication of a dinosaur nesting on a clutch of eggs like a bird. He also noted that hey tuck their heads in like birds do when they sleep. And it was in the Gobi where he found evidence of flocking behavior - he showed a slide of a fossilized flock of young and old dinosaurs caught forever in a desert flood. So, they brood, they flock, they lay eggs -- some even fly. These dinosaurs are this bird lover's new feathered friends.